11/01/2015 13:21:19,372 | INFO  | > Delayed. 11/01/2015 13:21:19,374 | INFO  | > Delayed. 11/01/2015 13:21:19,374 | INFO  | > Libraries loaded. 11/01/2015 13:21:22,439 | INFO  | > Installed 360 hook(s). 11/01/2015 13:21:22,440 | INFO  | > Libraries loaded. 11/01/2015 13:21:22,508 | INFO  | > Installed 8 hook(s). 11/01/2015 13:21:22,508 | INFO  | Initialized. 11/01/2015 13:21:22,543 | INFO  | > Installed 9 hook(s). 11/01/2015 13:21:26,028 | INFO  | Recreated effect environment on runtime 0728FC78. First intro video in startup stutters and process goes to not responding, and I have to end the task. No crashdump file that I can find. I was hoping to reproduce this with the Mass Effect 2 Demo, but it unfortunately works just fine there. While there's a newer version up with 0.12.0.640 it probably won't help, I just accidently uploaded a previous build first, but it might be worth trying nevertheless. Weird. 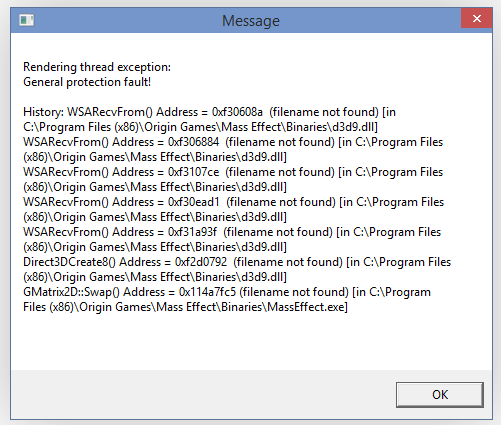 ME2 crashes as well for me. I tried disabling the intro videos but that didn't help. If it makes a difference I'm running the Windows 10 preview, I won't have access to my 8.1 machine for a week, but I'll recheck with that. Any overlays, game boosters or other software possibly interfering running? Long answer : I exited Razer Game Booster and RadeonPro, even though automatic boost was off and I had removed the profiles for the ME games. It works now. I'll check for depthbufffer in ME1 now.